Here are Tina Spence's pictures from the game: Huzzah's, held on 08-JUN-2017. The pictures are located in one of Tina's Facebook albums, which means you need a Facebook account in order to see them. >>> There is no "download all" option of which I am aware. Here are pictures from the game Vision Quest, held on 13-MAY-2017. Photographer Credit to Ellen Rowell of "Wishes Beyond Dreams Photography". >>> To download all of the pictures, click on the blue "Download All" button on the top right section of the page. Here are pictures from the game The Ring, held on 08-APR-2017. Here are pictures from the 2017 Annual Banquet, held on 11-MAR-2017. Here are pictures from the game "Darhkholm", held on 11-FEB-2017. Here are pictures from the recruiting event "Izumicon", held on 06-JAN-2017. Here is the video I took of Dustin & Rachels wedding. Here are my pictures from the game. Here is the Sunday afternoon camraderie video. This is a collection of various pictures that people have posted on FaceBook. Here are the pictures that Kelly Combs took of the high line team for Joshua's game "Night Of The Ancient Dead". We had a representative of the local newspaper, the Weatherford Democrat, at the game. Here's the very nice article written by the reporter/photographer Maggie Fraser. was Mark Magness, and half the photos were taken by by Mark and the other half were taken by me (Olan Knight). Here are 105 wonderful fabulous pictures of this fun novice game provided by Bobby Hayes! Wet Behind The Ears Photo Gallery. Blessings to Shannon Hayes, who took these great pictures! NOTE: You might need a Facebook account in order to view these pictures. Here are 1330+ fabulous pictures of this amazing level 8-10 game that ran on 13-OCT-2013! Hourglass Constellation Photo Gallery. Blessings once again on Mikki Thompson for these excellent pictures! NOTE: You might need a Facebook account in order to view these pictures. Here are some great pictures of the game KnightFall Photo Gallery. Many thanks to Tina Spence for these excellent pictures! NOTE: You might need a Facebook account in order to view these pictures. Here are some great pictures of the game 2013 Banquet Gallery. Here are some great pictures of the game Keep Krushers Gallery. Here are some great pictures of the Dallas players that prticipated as PCs in Ultimate Price. Ultimate Price was the culmination of a a 12 game series, and it FULLY lived up to all expectations! Thanks to William Haddon and Mike Paxton for writing, and to Brandon Slaten for producing this awesome game! Many thanks to all the photographers for these excellent pictures! Here are some great pictures of the team Group Challenges in DASTO. Many thanks to Amber Gallegos for these excellent pictures! NOTE: You might need a Facebook account in order to view these pictures. Here are some pictures of Team #1 heading into line-course portion of the mini-game: EJ3 Mini-Game. Many thanks to Jenny Wright for these excellent pictures! NOTE: You might need a Facebook account in order to view these pictures. Here are some great pictures of the three teams adventures from the game Aftermath. Many thanks to Rachel King for these excellent pictures! Here are some pictures of Team 4's adventures from the game Tales Of The Dead. Our team had a blast and after a shaky start, ended up doing VERY well! They even brought Quentin back ALIVE to Rupert! Here are a bunch of pictures from the game Price Of Life that was run by the Denver/Boulder chapter. Rich and Olan were PCs in the game. There are a LOT of pictures of a LOT of games. Check them out! Steal ideas! Be inspired! Here are a few pictures of Olan and Nathan in full Steampunk regalia after Saturday at A-Kon in full costume, all day long! As other people (hint, hint) send me their pictures, I'll add them to this page. Here is Tina's collection of pictures from several of the games that have run at their place in Weatherford, TX! Many thanks to Tina for these pictures! The pictures are loaded into Facebook, and you will need to have a Facebook account in order to see the pictures. Even with an account, you may need to log into your account at the top of the page because this will be a new session. If you don't have a Facebook account, then go to Facebook where you can sign up for your free account. Here is a collection of pictures from the game "Mordra's Cauldron" that ran at Gatewood Pavilion in Garland, TX on 19-FEB-2011. Once again we thank Phil Dobranski for the pictures! The pictures are loaded into "Picassa", and you need to have a Picassa account in order to see the pictures. Here is the link where you can sign up for your free Picassa account. Phil also created a full sized composite of the Air NPCs from the low-line game; as well as a smaller image of that same shot. I'll update this page as other people send me their photos from the game. I have one, count 'em ONE, picture from this game, but it's a good one: it's a group shot of the NPCs for the game! Hold the Control key and hit the "+" key to enlarge the image. Here is a fun little video link from this year's FtK, where Taryn and Jason put on a GREAT demo for the crowd. GOODONYA both! Thanks to Greyson for this one! Here's the same demonstration, but it's a little longer. It includes the full demo of Taryn vs. Jason, Taryn vs. David, Taryn and David vs. the announcer (Olan), and a bonus video of Taryn vs Jason in slow motion. I particularly like the slow-motion death roll by Jason at the end! :) Thanks to Rich for this video! The last 9 entries in this archive are videos, and include the Dragon encounter, the Priests of Themis, and the Hel encounter - which is hilarious! Note that the first 8 photos are of St. Louis, NOT of the game! Here is a slide show of the game "Welcome To Xindhi" that ran in Garland, TX on March 27th and 28th, 2010. Once again we thank Phil Dobranski for the pictures! As I get more pictures from other sources, I'll post them. 2010 Annual Banquet & Mini Game "The Dark One Attacks"
Here is a slide show of the 2010 Annual Banquet that ran in Garland, TX on February 20, 2010. Many thanks again to Phil Dobranski, a great friend who is good with a camera AND with web code! Travis Spence took these pictures of To Save A Mage, the high-level, extremely intense, wicked fun mini-game that ran in Weatherford, TX on 25 July, 2009. Thanks to Brittney Hoglund, we have pictures from the game Into The Woods, the two-day game that ran in Plano, TX on 21 & 22 March, 2009. Here are pictures from the Banquet, which was held at Gatewood Pavilion in Garland, TX. on 28-FEB-2009. MANY thanks to Phil D. for taking the pictures and hosting them! More pictures - coming soon from Brittney! Here are pictures from the game The Lock Challenge , which ran in Weatherford, Tx on August 19, 2008. Here are pictures from the game Breaking Principles , which ran in the Pickle Gulch Campgrounds in Colorado on August 02, 2008. Here are pictures from the game We've Only Just Begun , which ran in Weatherford, Tx on July 20, 2008. Here are pictures from the mini-game The Prisoner, which ran at the 2008 Annual Banquet in Weatherford, TX on March 29, 2008. Many thanks to Sarah Smith for the pictures! Here are pictures from the game Price Of Victory , which ran in the Pickle Gulch Campgrounds in Colorado on August 24, 2007. Trouble In Tocton, which ran at Winter Park in Garland, TX on April 29th, 2005. The game had an amazing maze, some great new ideas, and (dare I say it) a fabulous ropes course! :) Team 4 certainly had a GREAT time! Fencon, which ran in Dallas, TX on September 24-26, 2004. Larry Niven was the guest of honor, and Elizabeth Moon was the Toastmistress! They both had a grand time swinging swords at the Fight The Knight (FTK) event! We also ran two teams through our convention mini-game Midnight Shuffle! Here are the pictures from the game for Team 1 and for Team 2. 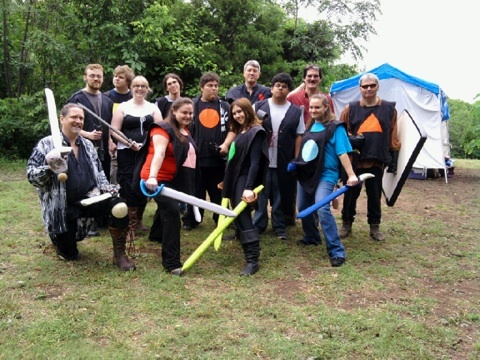 Here are pictures from the game Fairhaven Requiem , which ran in Garland, TX on June 28, 2003. Here are pictures from the game Zorg: Black Reign , which ran in Stroud, OK on June 7, 2003. Here are pictures from the mini-game Raw Deal, which ran at the 2002 Annual Banquet in Dallas, TX on January 26, 2002.